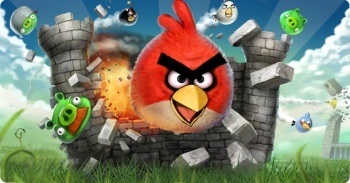 Rovio has replied to Nintendo's claims that $1 products are destroying the videogame industry. With 100 million downloads and millions of purchases, Rovio's 99 cent Angry Birds is what you might call a complete and utter success. The game even has its own movie trailer. Nintendo recently said that the cheaper business model games like Angry Birds follow is devaluing the industry, but Rovio thinks that's just the result of fear and unwillingness to change on Nintendo's part. Speaking to MCV, Rovio's Peter Vesterbacka responded to the idea that selling games for $1 is a bad thing. "It's interesting to see people like Nintendo saying smartphones are destroying the games industry," he said. "Of course, if I was trying to sell $49 pieces of plastic to people then yes, I'd be worried too." While consoles have typically been seen as the main stage for the videogame industry, Vesterbacka doesn't see it that way at all. "A lot of people in the games industry, they think the 'real' games are on consoles," he added. "You're only a 'real' games company if you do a big budget game. But we don't have that inferiority complex." Vesterbacka thinks that consoles are too unfriendly and should start emulating smartphones, rather than shunning them. For example, Rovio can update Angry Birds constantly through the smartphone platform, which is much tougher on consoles due to strict approval processes. These updates provide more value to consumers and keep them interested for longer. I'm actually surprised that Nintendo has been so resistant to the new wave of app-style content, primarily because of its popularity. It's similar to how Nintendo hasn't really taken the boat when it comes to online gaming either (though it's been making some strides). Rovio has been able to do its own thing on the smartphone platform and touch more gamers than many of the major console releases combined, and it's created a huge business for itself through $1 games. Shouldn't the big companies figure out a way to jump in on that, rather than hoping the concept will just go away?